Place names in New Zealand originating from ships and sea-men! Place names in New Zealand originating from seamen and ships! Abel Tasman National Park, Easter 2007. Acheron Head: Port Chalmers. The first steamer to visit Port Chalmers was H.M.S. Acheron in 1849. Acheron Passage: HM surveying ship Acheron charted the coasts between 1848 and 1855. The Acheron was 150 ft long and had a beam of 33 ft. She carried a crew of 100. She was the first surveying vessel in these waters to be fitted with auxiliary power – an engine developing 170 h.p. She gave her name to the deep (Acheron) passage between Dusky and Breaksea Sounds. Amodeo: Ten miles from Coromandel. 54 miles east of Auckland by steamer. Named after Captain Ameodeo of the S.S. Argyle which brought the first settlers to Amodeo Bay. Aoteo: On the harbour of the same name 6 miles from Raglan (27 km s. Raglan) 121 miles south east from Auckland. 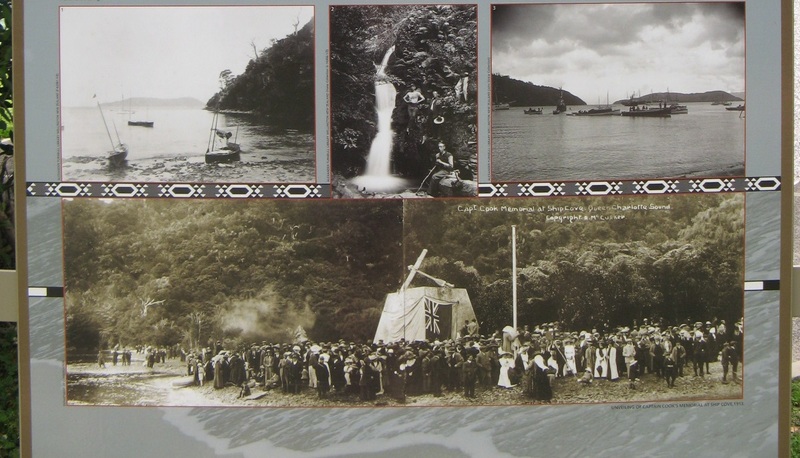 The Aotea was the canoe commanded by Turi, a Chief, and Aotea Harbour was were it made landfall. Arrow Reef - A reef in Nelson Harbour named after the brig Arrow, one of the New Zealand Land Company's expedition ships. In 1841 she was sailing up the channel and touched the reef. Two months later, Feb. 27 1842, the ship Fifeshire, on leaving the harbour, the tide carried her and she drifted and became a total wreck on the reef. She was on her maiden voyage and had landed her passengers at Nelson. In 1850 the Berkshire, on entering the harbour ran on to the reef but was floated off with the following tide. Astrolabe Island and Bay - near Motueka, in Abel Tasman National Park. Named after the French corvette Astrolabe captained by Admiral Dumont D'Urville who anchored there on January 16 1827. He came again to New Zealand in the same ship in 1840. Other places names in Blind Bay (now Cable Bay) include Point Adolphe, Astrolabe Roads, Point Liadet, Pepin Island and Separation Point. Abel Tasman NP - Bark Bay - the tide is out. Easter 2007. Auckland Point, Haven road, Nelson goes back to the earliest days of the Nelson settlement, and was named after the "Lord Auckland," the first emigrant ship that arrived in our harbor. For many years the property was identified with the Maoris, and with Sclanders' Bank. Bank's Peninsula: In 1769 Captain Cook thinking this was an island, named it Banks Island after Sir Joseph Banks the naturalist. It was not until Captain S. Chase of the Pegasus surveyed the coast 1809 that the "island" was found to be a peninsula. Balley Rock: A named given to a rock off Point Jerningham, in Wellington Harbour. Named after Captain James Sinclair's 163 ton schooner Balley, which sailed from London Dec. 23 1849 and arrived April 10 1841. Sinclair Head is also found in Wellington Harbour. Baton: Nelson. A runaway sailor boy named Batteyn Norton was employed here and the place named after him. In time the spelling was changed to its present form. Barrett's Reef - a cluster of rocks at the entrance of Wellington Harbour. Named after Richard 'Dickie' Barrett,(1807-1847) a whaler/trader of Queen Charlotte Sound, who piloted the Troy to that port. The intercolonial liner Wanganella liner struck here on 19th January, 1947, but was refloated some weeks later. The Wahine struck the reef 10th of April, 1968. Barrett Lagoon 5 kms. from New Plymouth was named after him, now a wildlife reserve. Benvenue Cliffs: In 1882 the ships Benvenue and City of Perth broke their moorings in heavy seas, the Benvenue running aground at Timaru beach. The crews took to lifeboats and reached the safety of the breakwater. An attempt was then made to save the drifting City of Perth. A number of surfboats and whaleboats were launched. Several capsized in the mountainous seas, drowning nine men. John Gibb�s 1883 painting, �After the storm�, shows the stricken Benvenue beneath the cliffs, subsequently named. in 1824, Mr Andrews started at the early age of nine years to learn the trade of his father, a stonemason. He worked twelve hours a day, two hours less on Saturdays, and received the sum of sixpence a day ; the wages of a journeyman mason at that time being from 3s to 3s 6d a day. His father, hearing that emigrants were wanted for New Zealand, decided to take his family, and sailed with about three hundred other passengers by the ship Bolton in October, 1841. The voyage was pleasant until the Cape of Good Hope was reached. Here the weather was very rough, the sea rose mountains high, foam dashed over the deck, and the passengers were under hatches. A climax to the crisis was reached when an accident rendered necessary the cutting adrift of the long boat. This was picked up by a passing ship which reported in London that the Bolton was lost, and it was not for two years afterwards that they knew the facts. New Zealand was reached in March, 1842. After calling at Wellington for a pilot, a start was made for Nelson, only one sailor being aboard, the rest having stopped at Wellington. It took twenty-four hours to reach Nelson, the ship anchoring in Bolton Roads, named after it. It was a curious fact that although there were 22 young men on board, and 33 young women, not a single match was made on the voyage. On land, Nelson was found to be anything but inviting, nothing but bush and craggy mountains in view. It is now, however, acknowledged to be the healthiest place, as well as one of the most charming spots, in New Zealand. Before the barracks were built, tents were used by the immigrants. For two or three years work was found by the New Zealand company at road-making, etc., at �1 a week and rations. The funds having been exhausted, the people began to cultivate the land, their chief means of subsistence previous having been ship biscuits, rice and mutton. The land was quite inadequate to produce enough for the people there, and many went to the Californian and Australian diggings, taking with them frames of houses built in Nelson. For education, each adult had to pay �1, and 5s for every child to the number of four. This was the beginning of the first education system in New Zealand. Bombay: On the Great South Road, 30 miles from Auckland. Most of the early settlers came from England in the vessel Bombay. Breeze Bay - Originally known as Nor-West Bay, it is the next cove up the harbour from Mechanics Bay, Christchurch. Named Breeze Bay after the coastal vessel Breeze was beached there in Feb 1932. The Navy was towing the Breeze to sea to act as a gunnery target when it broke loose and drifted ashore in Nor-West Bay. Eventually the Navy sunk it with charges. Britomart Point. Waitemata harbour, Auckland. A rocky point to the east of the city, originally called Soldiers Hill, then Flagstaff Hill was renamed Britomart Point after Stanley's dash to Akaroa. The Point was excavated in 1870s, and the debris used for harbour reclamation. Owen Stanley, stationed in Sydney, in command of the H.M.S. Britomart, 270 ton, 10 gun brig-sloop built at Portsmouth, England in 1820. In June 1840 she was sent urgently sent to the Bay of Islands, arrived 2 July 1840. British authorities learned that French settlers might claim sovereignty. On July 11 the L'Anbe, French man-of-war of 50 guns, Commodore Lavaud, in 103 days from France arrived at the Bay of Islands. Stanley made a dash to Akaroa on July 23 to head off French claims. She limped into Akaroa on 10th August with the 22 gun L'Aube, a French corvette, escorting French settlers arriving two days later but the British flag had been hoisted. The L'Aube, left the Bay of Islands on Thursday 30th July 1840. The Britomart suffered from the stormy weather on the way down, several port holes were stoved in, sail-stays split, and leakage required constant pumping. The French commander had no intentions of contesting the British claim. Fort Britomart was established during the 1840s and 1850s on Britomart Point, to bring order to the growing city of Auckland. Broughton Arm in Dusky Sound, New Zealand is named for Lieutenant William Robert Broughton. Broughton Island in the Snares Islands, New Zealand is named for Lieutenant Broughton. Bruce Bay: Westland. In 1865 the steamer Bruce brought one hundred gold-miners from Greymouth and Hokitika, but the field was not rich, and they stayed less than a year. Campbell Island about 150 miles S.E. of the Auckland Islands, and 320 miles or 590 kilometres south of Stewart Island, about 30 miles in circumference, was discovered January 1810 by Captain Frederick Hasselburg of the sealing brig, Perseverance. Hasselburg named the island after his employers Robert Campbell and Co. of Sydney. On a later visit that year Hasselburg drown at Perseverance Harbour, a cove on the east side of the island. Fur seals are plentiful. Caroline Bay, Timaru. A whaling station was set up here in 1839 by the Weller brothers of Sydney and one of their ships was the Caroline, a brig. Many shipwrecks occurred before the mole was built. Chaffers Passage in Port Nicholson between the reef and the shore, was named for the "Tory's" captain. The "Tory," a newly built, barque of 382 tons, eight guns, built by Somes Bros., London and Newcastle-on-Tyne, although purchased and sent out by the New Zealand Company in 1839. Cape Cachalot, Godley Head, Lyttelton Harbour, Canterbury. The first European name for Godley Head of Cape Cachalot was given by a French whaler Captain Langlois, in command of the Cachalot, about 1838 who was in Lyttelton Harbour in 1838 to buy land and who is reported to have nearly wrecked his ship on the headland. He negotiated a land deal with the Ngai Tahu chiefs in Lyttelton (then Port Cooper) and formed the Nanto-Bordelaise company which was backed by the French Government. He then returned to France, raised financial and government backing for the idea and recruited a group of settlers. August 9 1840 Captain Langlois in the "Compte de Paris" arrived in Pigeon Bay with 63 French settlers. Whalers and early settlers continued to use this name until 1900 when it was renamed Godley Head. Chatham Islands. "On November 29, 1791, H.M.S. Chatham, under Lieutenant William Robert Broughton (1762-1821) a British explorer, commander, in the brig HMS armed tender "Chatham" which had been blown off course en route to Tahiti, sighted Port Munnings. A landing was affected, the British flag was hoisted, the island was named after the Earl of Chatham. The islands lie 470 miles due east of Banks Peninsula and number some 30 islands including rocky islets. The main island, about 200,000 acres, of about which one-fourth is the Whanga lagoon (itself 45,000 acres). The others of the group, with the exception of Pitt's Island are uninhabited." Otago Witness 17 Dec. 1896. The Chathams: Their Early Inhabitants and Pioneer Settlers. Catlins River, Otago. Named after Captain Edward Cattlin, master mariner, commander of the whaler Genii, of Sydney, an early pioneer, who on February 15, 1840 purchased from a Native Chief the area that is now known as the Catlins (about 1000 square miles) for �30. He surveyed the navigability of the Molyneaux River (later named the Clutha River) in 1840. The ship Surat was wrecked on the coast near the mouth of the Caitlin's River, two bays south of Nugget's Point, next bay south from Cannibal Bay (named by Sir James Hector, after the discovery of several human bones and Maori earth ovens in the sand dunes.) Walk south to the end of the Cannibal Bay beach and over the sand dunes to Surat Bay. Chasteston: An old gold mining town 17 miles south of Westport. Began as Charlie Town. Named after Captain Charles Bonner of the ketch 'Constant' which traded regularly to Constant Bay with supplies for the settlement. Bonner also commanded the Woodpeaker. Chasland's Mistake, South Otago. Longitude 169.24 east, longitude 46.42 south, is a well-known point on the south-east coast. 101 miles south of Dunedin. This name, according to Thomas Chaseland, early whaler, derived from his landing there late one evening and discovering a herd of seals, which he waited till next morning to dispatch. By that time the seals had disappeared. Another theory: Known from the wreck of a ship here. In the 1940 remains can be seen at low water. The s.s. Otago built in iron at Glasgow, Scotland in 1863 of 977 tons sank on 4th December 1876 at Chasland's Mistake, South of Nugget Point en route Dunedin to Melbourne." Tommy" was a half caste New Hollander. Cheeseman Island in the Southern Kermadecs is named after the scientist T F Cheeseman of the Auckland Museum who accompanied an expedition to the Kermadec Islands Aug. 161887 on the NZ Government steamer Stella commanded by Captain Fairchild. Cooks Cove. Named after Captain Cook. Landed here for water. Cook Strait. Named after Captain Cook. Separates the North Island from the South. About 16 miles at the narrowest part and 90 miles at the widest. Coromandel: A township on the east coast of Coromandel Peninsula. Received its name on the 12 June 1820. On 30 May the H.M.S. Coromandel, the tender or store-ship of the H.M.S. Dromedory sailed into the Bay of Islands, left again on the7th June bound for the "River Thames" area (as the whole of the Hauraki Gulf was then known) for the purpose of taking aboard kauri spars which were in demand by the Navy. This vessel carried convicts to Australia before coming here in 1820 to take on a cargo of kauri timber. Corsair Bay, in Lyttelton Harbour, was named after the brig Corsair, 134 tons. Lyttelton Times 27th ult. : � The Omeo, 605 tons, after leaving the wharf, by recommendation of the Harbour Master, on Monday lay at single anchor in rather shallow water and when the breeze increased on Tuesday morning she began to drag down upon the Corsair. The Harbour Master went on board between 8 and 9 o'clock, a.m., and, finding a collision imminent, ordered the steamer starboard anchor to be dropped, and put his boat's crew into the Corsair to slack off her chains, so that she might past astern, and otherwise avoid further collision. As soon as steam was up, the Omeo picked up first her starboard and then her port anchor, but found that the latter had fouled the brig's chains, upon which, in the process of clearing, there was necessarily a very great strain. As the two vessels were now head and stern, the Corsair's chains tautened right underneath the steamer's hull, and in this position, the fans of the screw going a-head, must have struck and snapped them, upon which the brig was adrift and helpless. Captain McLean gave every assistance that was in his power to save the brig from damage; but to avoid the loss of both vessels it was absolutely necessary that the Omeo should get clear and moor in deep water. It remains to be said that the Corsair has not stood the hammering which she received on the beach. A survey was held next day, when it was found that her sheathing was extensively stripped off, a hole knocked in her planking on the starboard bilge, on which she lay, her fore foot gone, and the water washing in and out of her hold. She was condemned, and recommended to bet stripped of her running gear, and space, and to be sold for the benefit of whom it may concern. Otago Witness, 25 May 1861, Page 6 The actual price realised at the sale of the brig Corsair, with which the steamer Omeo got into collision, was �100 for the hull ; and for the sails, anchors, chains, spars, and rigging, &c, �214 11s. Curles Point: Port Chalmers. Capt. David Curle, lighterman and shipowner (the steam lighter ss Ruby, and the coastal steamer Governor Arthur). He came over from Melbourne in the Reinau Engelkens, a Dutch galliot, on 16 May 1859. She brought over the iron hull, broiler and engines for his lighter which he reassembled, the 18 ton ss Victoria which made its first run on the Otago Harbour 1 June 1859. He settled there at Curles Point. He built the Elizabeth Curle in 1864. He died on the 15th July, 1899 at his residence, Arden Bay, St. Leonards, Otago. Captain David Curle, on his 80th year. Christchurch, this day. Pilot Joseph Day, whose death is announced, was born in Kent some seventy-three years ago, and when an infant came to New Zealand with his patents in the ship Arab, which reached Wellington in 1841. The family settled at Day's Bay, the Bay being named after the deceased's father. The late pilot's first work was in assisting, his father and brothers in the trade between Wellington and Day's Bay, which was carried on by a vessel named the Flirt, owned by the head of the family. Later, trips were made down to the South Island, and the boat enjoyed the distinction of being the first vessel of any size to safely navigate the Sumner Bar. In the year 1840 the family came to reside in Sumner, being the first family to settle there. There was not a house in Christchurch at that time, and Lyttelton was mostly a town of canvas. Sumner was �he home of the late pilot from that time onward. For a while he continued to trade in the Flirt, visiting Kaiapoi and other places. With his brothers' he built a yacht called the Red Jacket, which had a great reputation in her day for speedy travelling. In the year 1867 the deceased was appointed pilot at Sumner, and for over forty-five years he hold that position. During that period he was often called upon to risk his life in order to save people who were in danger. Last January the pilot was presented with a special certificate from the Royal Humane Society and a gold medal from the residents of Sumner. On that occasion it was stated that the recipient had been, instrumental is saving no fewer than twenty-six lives, some of them at very great peril to himself. Deborah Bay, on the north western side of Otago harbour near Port Chalmers, Otago and immediately to the north of Careys Bay. Frederick Tuckett, the New Zealand Company surveyor, chartered Capt. Thomas Wing's schooner, Deborah, in June 1844 and headed south to survey the Otago block. From Waikouaiti, Tuckett set out to walk overland to Otago Harbour. The undergrowth was very dense and the Maori guides lost heart. Tuckett stuck grimly to the task undeterred by the remarks of the guides "Where is the road now?" But Tuckett would not give in, and at last they arrived at the shore of the harbour and saw the little vessel Deborah, which had taken Tuckett from Port Cooper to Moeraki, lying at anchor in the little bay which has ever since been known as Deborah Bay. Delaware Bay and Delaware Spit - On September 3rd 1863 en route from Nelson to Napier East of Nelson the brigantine Delaware, 241 tons, built in America, under command of Captain Robert C. Baldwin, was wrecked at Whakapuaka. The Mate lost his life. Wakapuka is a small bay about fifteen miles NE from Nelson, on the eastern part of Blind Bay. D'Urville Island. At the western extremity of the Marlborough Sounds, separated from the South Island by the 117 yards wide French Pass, a narrow, dangerous, tide swept strait, a notorious stretch. Dumont d'Urville, a French scientist and Captain in the French navy visited the area in 1824 in the corvette Astrolabe, and 1827. He sailed through the Pass "Passe de Francais" from Croixelles Bay on the Nelson side to into Admiralty Bay. Names on the maps for this area remind us New Zealanders of the Frenchman's enterprise and skill. Abel Tasman NP. Anchorage Beach. Easter 2007. Dusky Sound. Sighted by Captain Cook in the dusk of the evening on February 13, 1770. The excursion steamer Waikare (Union Co,) with 270 passengers and crew was wrecked as it was leaving the sound on January 4 1910, striking an uncharted rock. No lives loss and passengers and crew being brought to Bluff by the warship Pioneer, which was anchored at the Bluff. Enderby Island. One of the Auckland Islands. On 18 August 1806 Captain Abraham Bristow, an Enderby company captain, was returning to England from Hobart Town round Cape Horn in command of the whaling vessel, Ocean, when he discovered the Auckland Islands. Charles Enderby, chief commissioner to the company and Lieutenant Governor of the Southern Whale Fishery Company settlement of Hardwicke and artist with his 150 British settlers arrived at Port Ross in Samuel Enderby, Fancy and Brisk in December 1849 and stayed until August 1852. Endeavour Inlet, the largest arm of Queen Charlotte Sound, 8.5 kilometres long. On northern side of Queen Charlotte Sound, Marlborough. Named after Captain's Cook's ship, Endeavour. Nine miles from Ship Cove where Cook landed 15th January, 1770 and hoisted the Union Jack, distributed seeds to the natives and landed pigs. Originally named West Bay by Captain Cook, but renamed after Cook's ship HMS Endeavour by Captain Stokes of HM Survey Ship Acheron during his coastal survey of 1848 to 1851. Resolution Bay, situated near the entrance to Queen Charlotte Sound and south of Ship Cove, Marlborough. 18 miles from Picton by water taxi. 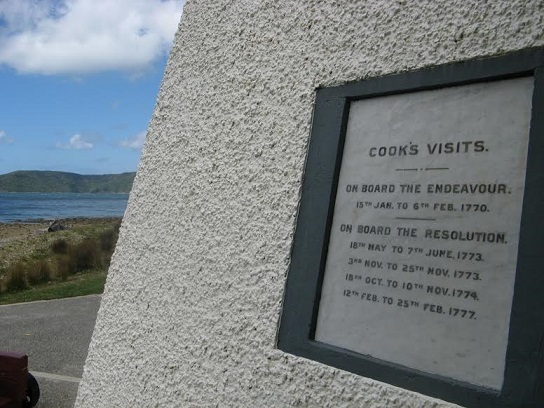 Captain Cook made four visits aboard the ship the Resolution. Cook earlier named the bay Shag Bay, but it was later renamed to Resolution either by Captain Stokes of the survey ship Acheron or Commander Drury of the vessel Pandora. Evans Bay, Wellington. Named after Captain Evans of the H.M.S. Acheron, which visited New Zealand in 1847 on a survey trip. Fanning Island. An atoll in the Pacific 3512 miles NNE from Auckland. Discovered by Captain E. Fanning of the ship Betsy in 1798. Fifeshire Rock. Rock at the entrance to Nelson Harbour near Haulashore Island. The barque Fifeshire wrecked on leaving Nelson on 27 February 1842. Had arrived from England via Wellington 1 Feb. 1842 under command of Captain Arnold. Was originally named Arrow Rock after the first ship to enter through the old harbour entrance. The name was changed to Fifeshire when the barque of that name foundered on the rock in 1842 after disembarking the first immigrants. Nelson. January 19. So far the efforts to get the barque Lutterworth off the rocks at the entrance of the harbour, just alongside the Arrow Rock, have been unavailing. At low water her keel was resting on mussel-covered rock, and she was heeling over to port, resting on keel and bilge, and no damage could be seen. She is not likely to come off to-night, the tide having turned. 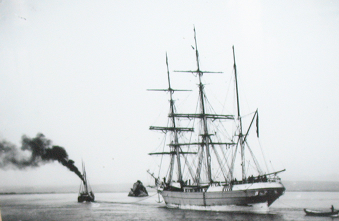 The barque Lutterworth ran ashore at Fifeshire Rock. She is in no danger, and no damage seems to have been done to her. All efforts to get her off have been unsuccessful so far and she is not likely to get off to-night as the tide has turned. Marlborough Express, 21 January 1904, Page 4 THE LUTTERWORTH SUCCESSFULLY TOWED OFF. Nelson, January 20. The efforts to get the barque Lutterworth off the mussel bank at Fifeshire Rocks were unavailing last night. The vessel, which had a gentle list towards the rock yesterday, turned over heavily towards the sea when the tide was coming in this morning, and is now lying with a strong list seaward. Later. The barque Lutterworth was successfully towed off at 10.45 by the steamer Charles Edward. The list she took earlier in the morning helped her, in fact she was afloat before towing commenced. The barque was towed to the outer anchorage apparently uninjured. Glory Track. The barque England's Glory of 751 tons wrecked in 7th November 1881 near Lookout Point at the Bluff. The Glory Track named for this ship starts just above this point. Gore Bay: East coast of South Island, near Cheviot, so named by Captain Cook after his second lieutenant in the Endeavour. Hawke's Bay. Named by Captain Cook, while on his first voyage to New Zealand in 1769, after his friend, Sir Edward Hawke, then First Lord of the Admiralty. Harriet Bay, near Cape Egmont. built at Williams River in 1860. Under the command of G. Smith stranded near Port Charles, Cape Colville on 4th July 1872. No lives were lost in the accident. Cape Colville is the most northern point of the Coromandel Peninsula. Cape Colville was named by Cook after Lord Colville. Hicks Bay, Auckland. Named by Captain Cook in 1769 after Lieutenant Hicks, who discovered it. Jordan: Forty miles from Blenheim. Jordan was a whaler who accompanied Lieutenant A. Impey in his unsuccessful attempt, made in May 1850, to find an overland stock route from Marlborough to Canterbury via the Awatere Valley. Jones' Head, Waikouaiti Bay. Johnny Jones (1809-69) a whaler and trader. Kennedy's Bay: Coromandel Peninsula. Named after John Kennedy of the H.M.S Buffalo. He loaded spars on the H.M.S. Perlorus. He became a trader at Tairua, where he married the daughter of a Maori chief. He met his death by tragic means. Le Bon's Bay: Banks Peninsula. The name is said to come from a French sailor who was landed at the bay. Captain Le Bas entered the bay in mistake for Akaroa. He sent a boat's crew ashore, one of whom, named Le Bon was the first to land. Lowry Bay: Seaside suburb of Wellington named by Wakefield after the first mate of the Tory, Richard Lowry. Lyall Bay: A large bay near Wellington heads, three-quarters of a mile wide. Named after Dr. David Lyall, of H.M.S. Acheron which was on a survey cruise in NZ in 1847. The bay has had two spellings in the past as, "Lyells Bay" and as "Lyall's Bay" and is now called Lyall Bay. Once referred to as "False Bay" due to the number of shipwrecks which occurred there - sailors mistaking Lyall Bay for Port Nicholson and sailing on to the rocks. Dr Lyall later became a scientist. Two newer streets in the Lyall Bay area: Endeavour Street (formerly Cook Street) and Resolution Street are named after Cook�s two vessels of that name and Cook Strait is named after James Cook who more than once made his way but never entered Port Nicholson. Magnet Bay & Magnet Bay Rd, Akaroa, Banks Peninsula. The old Bruce Hotel was opened in 1842 by Captain James Bruce, a whaler, who had worked for �Johnny� Jones after the wreck of his brig Magnet in 1842. He became a popular host for whalers. He built a cottage for his nieces who arrived from Scotland in 1855. After Captain Bruce's sister Margaret died back home in Dundee, Scotland, he encouraged his brother-in-law John Donnet, a cooper, to bring his daughters to Akaroa. There were five of them, four single and one, Isabella, married to Mr. William F. Bruce (no relation to Captain Bruce). The party of eight, including Isabella and William's son, arrived aboard the Caroline Agnes in Lyttelton in August 1855. In February 1858, he sold his hotel and died on October 6 and is buried in the Akaroa Cemetery. [Maybe another vessel: Magnet, barque, of 148 tons, built Dartmouth, UK, 1815. Lbd 72.8 x 22 x 5.1 ft; reg. London, 20/37, transferred to Sydney 25 November, 36/1837, 8/1844. Captain John Chend Lewis. Wrecked at Ikolki (Peraki) whaling station, south of Akaroa, Bank Peninsula, New Zealand, 3 September 1844. One crew member drowned.] Arrived Port Jackson, Sydney, Oct. 7 1844 the, Ariel, schooner, 104 tons, Capt. Preston, from Port Nicholson the 17th Sept with 40 tuns black oil &c. Passengers Mr Dempster, Capt. Hay, Mr Robinson, Miss Hatton, Mr Curtis, Capt Lewis, Mr Seagrove, Mr Levi and Mr Watson and four of the crew of the Magnet. Miranda: On the Firth of the Thames. A redoubt was built at this place in 1863 by the Forest Rangers from the H.M.S. Miranda, which was engaged in transporting troops. Mt. Cook. In 1842 Post-Captain (later Admiral) John Lort Stokes, on a survey cruise, sailing, down the West Coast in the H.M.S Acheron, gave the mountain its European name, in honour of the English navigator Captain James Cook who called these mountains 'the Southern Alps.' Stokes, Evans and Richards all subsequently became hydrographers to the Admiralty. The mountain was surveyed from the sea, and its height approximated at within 100ft of that which it was ultimately ascertained to be. There lives at Port Chalmers in a house known as Rodney Cottage, one, Archibald Fullerton, who was a seaman on board the H.M.S. Acheron during the vessel's survey of the New Zealand coast between 1847 and 1850. The Acheron was a steam side-paddle wheeler of 760 tons and 160 horse-power. The expedition was in charge of Post-captain John Lort Stokes, who had Captain Richards as commander, and Captain Evans as master. Captain Stokes had Tommy Chaslands on board the Acheron with whom Stokes had the utmost confidence. While at Preservation Inlet Bishop Selwyn arrived in the Undine and came on board for breakfast, robed in his canonicals it being Sunday, and conducted a service. The Lady Clarke bought down coal to Otago Harbour for the Acheron as ballast - first shipment for Port Chalmers. 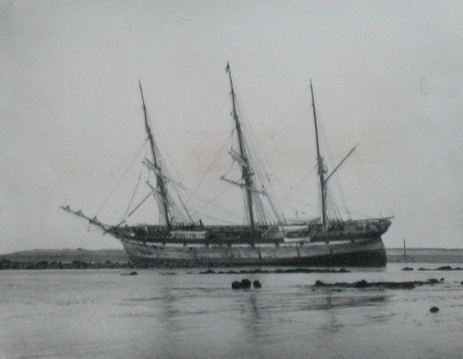 The Acheron returned to Portsmouth in 1851. Mr Fullerton then joined the HMS Rodney and served in the Crimea War, being present at the taking of Sebastopol. He served in the Ferment, Nile, and Scorpion and retired from the navy in 1857. Mt. Furneaux, (2960ft.) Endeavour Inlet, in the outer reaches of the Queen Charlotte Sound. Named after Captain Tobias Furneaux (1735-1781) an English navigator who commanded the ship Adventure accompanying Captain James Cook, in the Resolution, on his second voyage . Mt. Sinclair, 841 meters, opens onto Holmes Bay, (formerly Sinclair Bay) named after Captain Francis Sinclair. Holmes Bay is in Pigeon Bay, Banks Peninsula. The cutter, Jessie Millar, 10 tons sailed from Banks Peninsula on May 10th 1846 for Wellington and never seen again. Captained and owned by Captain Francis Sinclair. Nicol's Passage: Otago Harbour. The Gil Blas was the first square rigged vessel to come up to Dunedin, Captain John Nicol, a Scotman, came out with the s.s. Ladybird. Died at Caversham, Dunedin in 1877, age 72. A supper was given by the Members of the Provincial Council to Captain Nicol on the evening of the 12th inst., as a tribute of respect to that gentleman for having had the public spirit to bring the Gil Blas up to Dunedin. Nearly the whole of the members of the Provincial Council were present. After the usual patriotic toasts had been given, the health of Captain Nicol was proposed and duly responded to. It was suggested that, to commemorate the event of the arrival of the Gil Blas at Dunedin, the channel between the islands should be named "Nicol's passage." The proposition was unanimously received, and a bumper was drunk at the christening. Oriental Bay: Oriental Bay is named after the second New Zealand Company ship, the Oriental which arrived at Port Nicholson on 30 January 1840. Pacific Ocean - Named by Magellan because it seemed so calm after the storm near Cape Horn. He obviously never witnessed a Pacific cyclone. Pac is related to the Latin word for peace. The Peaceful Ocean. Paterson's Inlet, Stewart Island. Over the hill from Halfmoon Bay. Named about 1850 by old whalers, who made this their chief port for water and wood. A magnificent deep water harbour with two extensive arms - NW & SW. Bush clad to the water's edge with many sheltered beaches of golden and white sand. Fish plentiful. Pegasus Bay: North of Banks Peninsula. Named by William Stewart; first mate of the Pegasus, which was under the command of Captain Chase, which surveyed the coast in 1809. Captain Chase attempted to sail between "Banks island" and the mainland, in 1809. The first officer of Pegasus was William Stewart, and it was he who did the charting. He is also the source of the name of Stewart Island. Pelham Rock, in Bluff Harbour, situated 300 yards off Stirling Point and roughly 150 yards offshore, has claimed a few vessels including the steamer Pelham which the rock was named for in 1886. Perlous Sound named after His Majesty's war brig H.M.S. Perlous, which sailed into the sound in 1838 under the command of Captain Chetwode. John Guard had reported to him that there was a passage between Queen Charlotte Sound and Admiralty Bay and the warship was piloted through the sound that bears its name. Pickersgill Harbour, Dusky Sound in Fiordland is associated with Cook's second voyage. Cook is remembered by the names Cook Channel and Cook Stream, which flows into Pickersgill Harbour. Pickersgill Island. Pickersgill was master's mate Endeavour, and later lieutenant commanding Resolution. Port Levy, Canterbury. Two Sydney traders named Levy and Cooper, Levy's name was given for this place and the other for Port Cooper which is now known as Lyttelton Harbour. Port Molyneux, Otago. Name for the mouth of the Clutha. Named by Captain James Cook after his sailing master, Robert Mollineux. Port Nicholson, Wellington's harbour was named, after the harbour master of Port Jackson, Sydney, in April 1826, by, Captain James Herd, the captain of the port in 1820, on the Haweis. Ian Nicholson was the great-great-grandson of John Nicholson, Master, Royal Navy, who was Sydney's first Master Attendant (1821-42) and after whom the harbour was named. The Rosanna was accompanied by the cutter Lambton under the command of Captain Barnett. Port Pegasus, Stewart Island. Named by Captain S. Chase, of the ship Pegasus, who discovered the well-sheltered harbour on August 7, 1809. Port Ross, In the Auckland Islands. Excellent harbour. Named after Captain James Clark Ross who lead a survey party in HMS Erebus and the HMS Terror in 1840. Dr. Lyall a scientist was onboard. Port Underwood, Marlborough. North end of Cloudy Bay. The first vessel to enter the Queen Charlotte Sound by the Tory Channel was the brig Wellington belonging to the Sydney firm of Kable and Underwood. One of the finest harbour's in New Zealand. Named after Josiah Underwood, a large ship owner, of Sydney, 1825. Abel Tasman NP. Bark Bay campsite. Easter 2007. 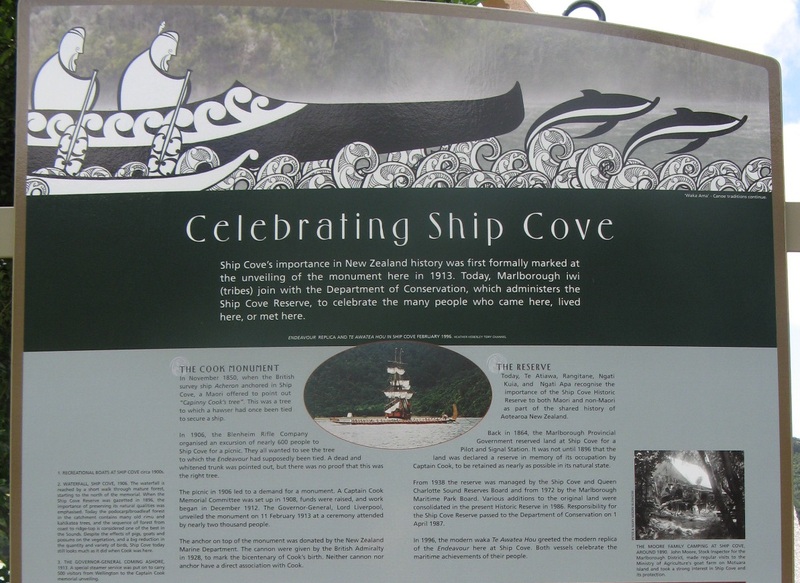 Ship Cove: The place where Captain Cook took shelter from storms and tempests which abound in the Strait which is named after him, and where he careened his ship, Endeavour, and sojourned for some time. Ship Creek: SH6, west of Haast, West Coast. Named after a wreck that occurred 1500 km away at Cape Otway in Victoria in 1854 when the 2600 tonne, "Schomberg" on her maiden voyage ran aground and several years a later pieces of her washed up here. Shipwreck Bay was named with the sinking of ships including the 1863 paddle steamer Favourite built in Australia in 1863 of 59 tons, sank on 1st April 1870 after going ashore on Ahipara beach during a gale which is still visible in the low tide surf. Ahipara is located at the southern end of the 90 Mile Beach. Ahipara, just 14 kilometres south of Kaitaia. The remains lie in Shipwreck Bay south end of Ninety Mile Beach. The crankshaft of the Favourite was still 6ft out of the water in January 2015. Shipwreck Bay, Bluff. At the end of State highway way at Greenpoint Domain the walkway leads towards Shipwreck Bay, a ships' graveyard. Remains can be seen today. - The Kekeno, a schooner, built in Auckland in 1879, arrived at Bluff in 1882, under the command of the former New River (Invercargill) Harbourmaster Captain J.B. Greig. She was driven ashore in Bluff on 24 September 1884 and was subsequently rebuilt as an oyster boat and was in service until 1955 before being abandoned in Shipwreck Bay on 19 July 1955. - The Hirere began life in 1896 as a tug in Auckland then became a passenger ferry before joining the Bluff oyster fleet. - The Savaii was built in Matautu, Samoa. Completed on 1896. She came to Bluff in 1914, at which time she was owned by B.T. Johnson and R.A. Georgeson. She came to Shipwreck Bay on 10 August 1949. - The Sir William Wallace was completed in 1849. In 1936 she was acquired by the Rakiura Oyster Company Limited, Bluff, who kept her until 14 August 1951 when she was dismantled and derelict at Bluff. - The Dispatch built in Pyrmont, Sydney, in 1883, was registered in Invercargill in 1899 and commenced service as the Stewart Island ferry the following year. She was withdrawn two years later and spent four years with the Bluff Harbour Board before being converted for oystering. An oil engine was instilled in 1949. but shortly afterwards sent to the bay. Slains Castle Rock: The barque was a troop carrier in the 1845 northern war, and went aground on this rock at the entrance to the Kerikeri River in the northwestern Bay of Islands. The sea breaks on this rock in a big swell, otherwise it is submerged. The Slains Castle arrived at Auckland on the 21 April 1845 and the regiment disbarked the following day. On the 28th April the corps left on the same transport for the Bay of Islands to deal with the Maori tribes led by the Chief Hone Heke. Solander Island. Between Stewart Island and the mainland. Named after Dr Daniel Solander, the Swedish botanist on the Endeavour, Feb. 15 1770. The Maori name is Hau-tere meaning "swift wind." Somes Island, Wellington Harbour. In honour of Joseph Somes Deputy-Governor of the New Zealand Company by the crew of the Tory, who gave the name, were probably thinking at as much of the great ship building firm which Joseph Somes had founded, as the man himself. The New Zealand Company had brought the Troy from Somes in 1838. Ward's Island was named after the then secretary of the NZ Company. Baring Head was named after the Hon. Francis Baring, M.P. one of the members of the society first called the NZ association founded by Edward G. Wakefield. in 1837. The SW bay in Port Nicholson was called Lambton Harbour after Lord Durham, governor of the company. Thorndon Flat was named from the seat of Lord Petrie in Essex, Thorndon Hall. Sinclair Head after Sir George Sinclair, Bart., M.P., Pencarrow Head after Pencarrow, the property of sir Wm Molesworth, Bart., M.P. The Hutt River (Harataonga) and Valley are named after Wm Hutt, M.P., an active director of the company. Evans Bay gets its name from Dr Evans, second in command to Colonel Wakefield in the NZ Land Co's expedition. From the 1880s to 1995 Matiu/Somes Island was used for animal quarantine purposes. Until 1920s, the island was also used as a human quarantine station to prevent the introduction of diseases such as smallpox. During both War World Wars civilians considered to be a security risk were interned on Somes. These were mainly people who came under suspicion because of their foreign sounding names or accents. Today concrete gun placements from WWII can still be seen. 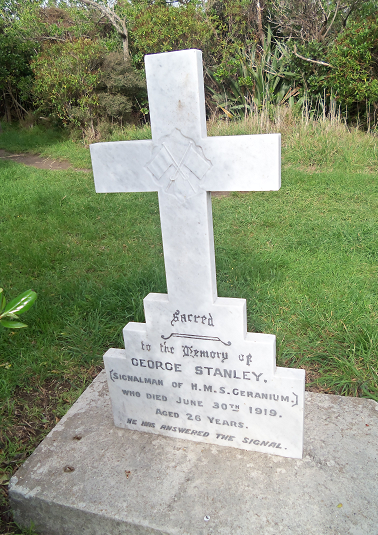 George Stanley (signalman of H.M.S. Geranium) who died June 30th 1919. Aged 26 years. He has answered the Signal. Sporing's Island: Named by Cook after Joseph Bank's secretary, Sporing. Stanley Bay: Auckland. The bay and Stanley Point, near Devonport, Auckland, preserve the memory of Captain Stanley of the H.M.S. Britomart. Stella Passage: Tauranga Harbour, in the Bay of Plenty, possibly named after the NZ Government steamer Stella. The Stella Passage in the Kermadec Islands was named after the Stella. The Kermadec Islands a group of four islands 600 miles (750 to 1000 km) north-north-east from Auckland was annexed by NZ in 1887. Stewart Island. It was not known as an island until William James Stewart, 1776-1851, a whaler, from Dundee, in the schooner Prince of Denmark, discovered it as such in 1808. Capt. Cook called it a peninsula. In 1809 the Pegasus, sailing from Port Jackson, Australia, on a sealing expedition had aboard it as first officer William Stewart (later commander of the James Hay). Whilst the boat was in the large south eastern harbour, 'South Port' later Port Pegasus, which now bears its name Stewart began charting the southern coasts and his work is acknowledged to this day in the island's present name. Stirling Point: Bluff pilot station named after Captain William Stirling who established a whaling station nearby in 1836. He purchased and cultivated the land around Stirling Point to service whaling bases. State Highway 1 starts at Stirling Point, 1 km south of Bluff. Seven miles (5k) east from Owaka via Newhaven. 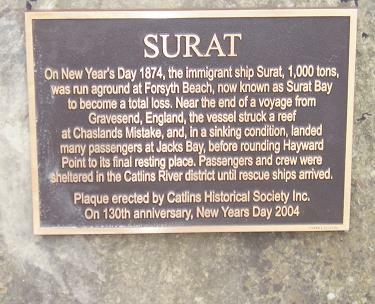 The Surat, 1,000 tons, built at Jarrow in 1863, when arriving from UK with 271 immigrants she struck a rock near Chasland's Mistake on 31st December 1873 and beached at Surat Beach on 1st January 1874. No lives lost. The Surat was wrecked near the mouth of the Catlins River. A good place to view the sea lions were a sleep on the sand or sand dunes with some out in the sea. About 60 descendants of the sailing ship's 271 passengers and 37 crew, all of whom survived were present at the unveiling at New Haven on the 130 anniversary. 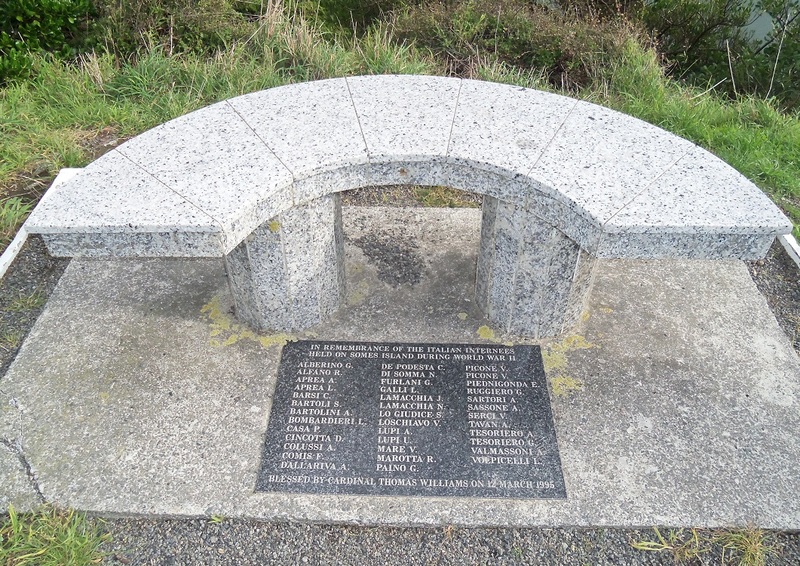 The plaque is on private land just off the road at the corner of the road to Surat Bay, mounted on a 3' high boulder which is mounted on railway irons driven into the ground, very appropriate since the Surat had railway irons as its main cargo. Bruce Collins, author of 'The Wreck of the Surat and Rocks, Reefs and Sandbars', attended the unveiling on New Year's Day. Collins, Bruce E. The Wreck of the Surat Otago Heritage Books, Dunedin 1991 40 pages. Indexed. Appendix 1: Passengers on the Surat and Appendix 2: Surat Passengers in Otago and Southland, 1888 (as entered in Stone's Directory). Photo of the ships figurehead appears on the front of the book. Numerous illustrations including the Surat, relics from the Surat and photographs of two reunions of the Surat survivors. The Surat sailed from London on 28 September 1873 with 271 immigrants bound for Port Chalmers. Amongst the passengers where William & Amelia HORNE with their nine children. 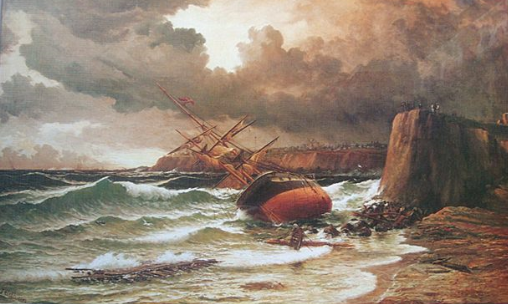 The Surat,1,000 tons, built at Jarrow in 1863, nearing the end of its voyage struck a rock near Chasland's Mistake on the South Otago coast on 31 December 187 and was beached at Surat Beach on 1st January 1874. No lives lost. All passengers and crew survived but most of their luggage was lost. William Horne was a tailor and settled in St Kilda, Dunedin until his death in 1908 at the age of 86 years. William's oldest child Amelia married a fellow passenger Thomas BROADLEY, 9 months after the wreck. The captain not hailing nearby vessels for assistance, threatened passengers who did, made first for Jacks Bay, where about one hundred passengers disembarked, then with all sails set and her ensign flying upside down attempted to head to Port Chalmers, narrowly missing the headland, and eventually beaching her at a sandy bay now known as Surat Bay, about 11km from Owaka. Captain Charles Hayward, harbourmaster, had observed the ship in trouble from the Catlins River heads. He offered distressed passengers assistance, taking many of them into his house for food and comfort. In his journal, Hayward described his house as a "large hut", but in front of it was a small grassy patch where the passengers collected like a picnic party. "The ship's cook, with the aid of our stores, and a few things that were brought ashore, soon relieved the appetites of the hungry", Hayward wrote in a journal which is now deposited at the Otago Settlers Museum. A French warship in Dunedin at the time, Vire , volunteered to ferry the passengers to Dunedin. The wreck was sold to Messrs Guthrie and Larnach for �7050, a price which included the passengers' luggage. Many passengers became involved in a lengthy battle with the salvage company to have their personal effects returned. The ship was a total loss and much of her timber found its way into the construction of local houses. The official inquiry resulted in several crew members losing their certificates and the captain, Edmund Johnson, serving two months in prison. Waikawa is a large inlet from the sea, and the name of a Hundred district. Mr Tuckett in 1844, said the Maori name of it was Wai-kou-roa (water, good, long), so the one may be the name of the harbour and the other of the river. In the fortys this harbour was known in Sydney and to the whalers as "Success River," after the name of the first vessel known to have entered it. 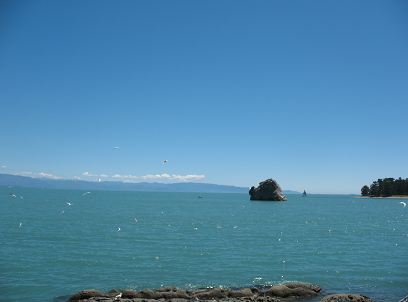 Tasman Bay, Nelson. Abel Janszoon Tasman (1603-59) during his famous 1642 voyage brought his two ships, Heenskerck and Zeehaen, to their first anchorage here. Taylor's Mistake. A small bay between Sumner and Lyttelton Harbour known as Taylor's Mistake as early as 1853. It is separated from Sumner by the spur terminating in Sumner Head. It lies between Whitewash Head and Penguin Point, a mile to the south of the former. Alan Taylor, Wanganui in Jan. 2009 Between the mid 1840s and 1871 my great-great grandfather, Captain Thomas Ballardie Taylor (T. B. Taylor, born Anstruther, Scotland) owned and operated a mercantile trading and shipping firm, Taylor & Watt, conjointly with his partner William Hogg Watt (first mayor of Wanganui). Their firm traded with as many as fourteen ships operating in the coastal waters of New Zealand, plied trans-Tasman routes as distant as Adelaide, S. A., and operated at least one chartered ship between Wanganui and England. The firm was headquartered in Wanganui. Over the course of this operation, up until Taylor's drowning in Cook Strait after falling from the brig "Lady Denison" in 1871, and subsequent to that the firm traded in and out of Lyttelton many, many times with Captain T.B. Taylor as master of one of their numerous ships. Without hesitancy the generations of our family from T.B. Taylor's day to the present have recounted the infamy of his mistaking the bay in question for Lyttelton Harbour when seeking its entrance on a very foggy occasion. Hence the mirth we share about our ancestor's navigation skills and the name of the bay. Another possibility: The bay was originally called Vincent's Bay after a Captain John Vincent who wrecked a schooner there. The ship Gwalior left England in April 1853, on the 16 April and Captain Davidson threw himself overboard, and the ship was taken over by the chief officer Taylor, who sailed the ship to New Zealand, the passage taking 200 days. It is possible that Captain Taylor anchored the Gwalior in the bay. Named in the coastal directory as "Taylor's Mistake sometimes mistaken for Sumner Bay". In 1858 a Captain Taylor of the United States Ship Volga who is said to have mistaken the bay for the entrance of Lyttelton Harbour. There is also a Captain Taylor of the ship Chrystolite who has been attributed as having the bay named after him. It is unlikely these two later incidents caused the naming. The name appears in 1858 (S.O.L.B., No. 1, 28 Oct. 1858). In N.Z.A. (L), 1857, p34, the name is given as "Vincent's Bay or Taylor's Mistake" so called because sometimes mistaken for Sumner, which is the next bay to the west. �Place Names of Banks Peninsula� by Johannes C Andersen Pub. Govt. Printer, 1927. 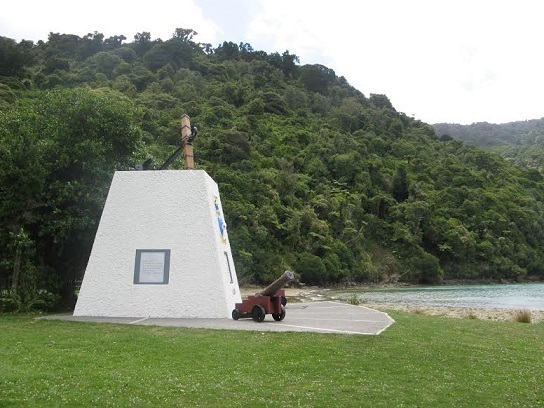 The allusion to painting the triangle on Godley Head may have been suggested by Captain Taylor of the United States ship Volga since it is alleged he made the error of trying to get into Lyttelton via Sumner, and hence Taylor's Mistake. Leaving Lyttelton, the bridle track leads from the top of the Zigzag to the right, and sweeps round the high ground to the top of the bay originally called Vincent's Bay, and more recently Taylors Mistake, owing to the master of a vessel running in here during the night-time, thinking he was about to pass over the Sumner Bar. Taylors Mistake, a bay between Sumner and Godley Head. Thoms Rock: Lies on the south coast a kilometre southeast of Karori Rock. Named after Joseph Thoms - sealer, whaler and trader of Porirua. Te Awaiti. Tory Channel. The name means 'little river.' In 1827 Capt. Guard established a whaling station here and by 1839 forty houses existed. The name was corrupted by the whalers into Tar White. Birthplace of the first white child in the South Island in 1831, John Guard, both parents being English. Willsher Bay: Otago Named after a whaler who married Maksriri. Willsher well-known bay on the coast line near Port Molyneux has been named after Willsher, and subsequently a township which is rapidly becoming a favourite seaside resort, and partly because a piece of land containing some 20 acres situated at the mouth of the Korero Greek, and known as the Willsher claim, has been for many years used by the inhabitants of the Clutha as a public recreation ground. The property was registered in the name of Willsher, but neither Willsher nor a title could be found. Quite recently, however, a well-known Old Identity found the title among some papers and sold the property to Mr Thomas Mackenzie, M.H.R., who has promised to hand it over at the price he paid for it to the people of the Clutha as a recreation ground. Willsher, who gave his name to these places, was one of the oldest residents in Otago. It was away back in the early forties that attention in Sydney was drawn to Otago as a country suitable for stock raising. A syndicate was formed to charter a vessel, ship stock, and take up some suitable country, and Willsher, then a young man, was sent in charge. The fates were, however, against them, for they experienced a rough tempestuous passage, in which all the stock except one cow died. They brought up at the old Maori landing near the mouth of the Korero Creek, and there landed the remaining cow. Willsher was so disgusted with the failure of the expedition that he decided not to return to Sydney in the vessel, but to remain in New Zealand and take up his abode with the tribe of Maoris who lived in the neighbourhood. The cow lived and gave birth to a bull calf, and from this pair sprang a herd which Willsher grazed on the open land round what is now Port Molyneux. About 1859 Willsher disposed of his cattle,.. Willsher returned to the old country. About the year 1880, however, a lady, well known in Otago, was on a visit to the old country, and before returning to the colony was making some purchases in a shop in London, when in course of conversation she remarked to the shopman that the goods she was buying were for exportation to Otago. " Pardon me, madam," said a well-dressed gentlemanly looking man, walking up to her, "did I overhear, you say you came from Otago? Do you know the Clutha?" On being answered in the affirmative and names being exchanged he turned out to be Willsher, whom the lady had often heard of but had never seen. What a contrast between Willaher dressed in the height of London fashion and Willsher as he was known by the old settlers of the Clutha, without boots on his feet and with precious few clothes on. Wickliffe Bay. Named after the ship John Wickliffe which entered Otago Harbour on 23rd March, 1848 with William Cargill on board and he was the leader for the first settlers. A small bay on the seaward side of the Otago Peninsula. In the 1950s the remains of the ship s.s. Victory wrecked July 4 1861 could still be seen. Wreck Bay now known as Boulder Bay and the adjacent coastline of Rangitoto Island, Auckland Harbour is a graveyard for at least thirteen ships that were dumped on the island between 1887 and 1947. It was a place ashore that was out of sight for the hulks to rot or rust away. Young Nick's Head. Poverty Bay. Captain James Cook promised a gallon of rum to the one who should fight sight land and on October 6 1769, at 2 o'clock in the afternoon on Friday, land was sighted by Nicholas Young, the cabin boy, hence Young Nick's Head. Nicholas was born in Fife in 1753 and was killed on the 17th Feb. 1779 at the same time that Cook lost his life in Hawaii. Torrent Bay and the lagoon at high tide, Abel Tasman NP. Easter 2007. Does the name remind you of a ship? Streets in Petone and Wellington were named after the emigrant vessels. Tory St, Cuba St, Aurora Terrace and Parade, Adelaide Road, Duke of Roxburgh (Roxburgh St), Bolton St, Clifton Terrace. Glenbervie Terrace in Wellington was named after a store ship which arrived 7 March, 1840. Coromandel (St), 662 tons, sailed from London 13 December, 1839 and arrived 29 August, 1840 with 44 passengers. Bengal a suburb in Wellington was named after the vessel Bengal Merchant, 503 tons, which sailed from London 30 October, 1839 with 160 passengers and dropped anchor off Petone Beach 21st February 1840. Brougham (St.) a store ship sailed from London 16 February, 1840 and arrived 25 June, 1840. Oriental Bay was formed by ballast discharged by the vessels. PLACES IN WELLINGTON Mr. Albert J. Allom, of Auckland, who held an official position under the New Zealand Company in connection with the planting of the Wellington settlement, some years ago wrote an interesting^ letter to the press as to the naming of well-known places about Wellington. His primary purpose was to protest against the oft-repeated orthographical error of inserting an "a" in the spelling of Somes Island. This done, Mr Allom proceeded as follows : � As I am often asked questions upon this subject, may I here record, once for all, how, in the month of September, 1839, this and other places at Port Nicholson were named by Colonel Wakefield, the leader of the company's preliminary expedition, who first arrived there on 20th September, 1839, in the ship Tory, Captain Chaffees, R.N. Port Nicholson itself had been so named a few years previously by the captain of a Sydney vessel, after the harbourmaster of Sydney, then called Port Jackson. Somes Island (Matue) was named after Mr. Joseph Somes, a great London shipowner, then Deputy-Governor of the New Zealand Company. Ward's Island was named after the then secretary of the company. Baring Head was named after the Hon. Francis Baring, M.P., one of the members of the society first called the New Zealand Association, founded by Edward Gibbon Wakefield in 1837. The south-western bay of Port Nicholson was called Lambton Harbour after Lord Durham, the governor of the company, Thorndon flat was named from the seat of Lord Petrie in Essex, Thorndon Hall ; Sinclair Head after Sir George Sinclair, Bart., M.P. ; and Pencarrow Head after Pencarrow, the property of Sir William Molesworth, Bart., M.P. ; Barrett's Reef, at the entrance of Port Nicholson, obtained its name after Dicky Barrett, the whaler, of Queen Charlotte Sound, who piloted the Tory to that port, The Hutt River (Harataonga) and Valley are named after William Hutt, M.P,, an active director of the company. The township of Wellington in 1840 was first called Britannia, but early in November of that year the name was changed in recognition of the services of the great Duke to the company, and generally to the cause of colonisation. I may perhaps, be permitted to add that on the other side of Cook Strait the sheep station named Flaxburn, but now generally mis-spelt "Flaxbourne," in 1847 the property of my old friends Sir Frederick Weld and Sir Charles Clifford, was named by Sir Frederick (then Mr.) Weld with a view to Anglicise its Maori name, Wai Harakeke, and I remember the confab (at Whare Kaka, in the Wairarapa) and the many pipes we smoked over it before we decided on that name. Deborah Bay, on the western side of Otago Harbour, was so called because it was the anchorage of the schooner Deborah, about June, 1844, when conveying Colonel Wakefield and Captain Symonds, on an exploring trip to the southward. Irvine-Smith, F. L Streets of my City. First published Nov. 1946 by A H & A W Reed. Has been republished. Mr John Johnston merchant (1809-1887) reached Wellington in 1841 by the "Prince of Wales" and represented the Wellington country districts in the Provincial Council. In 1857 he was called to the Legislative Council and in 1878 retired from his business, leaving it to his 2 sons, the Hon. Walter Johnston and Sir Charles Johnston, later a city mayor (1890). Johnston St. recalls the name of Johnston. There is a charm of association in names, where mere figures do not possess. Streets in Port Chalmers named after the early ships. Wickliffe Tce. The John Wickliffe arrived 23 March 1848. Streets in Milton named after sailing ships. Strathallan Street in Dunedin and the main street in Timaru, Strathallan Street, is named after the ship Strathallan. Other streets were named after early settlers. Aramoana is a windy seaside resort at the north entrance to Otago Heads with some streets named after mothballed vessels: Moana Street, Mokoia Street, Paloona Street and Plucky Street. From Dunedin go via Port Chalmers. Within two years of the war world trade fell away and a number of surplus Union company ships were moth-balled at Port Chalmers including the Paloona (sunk 20 Sept. 1928), Mokoia (sunk 28 Nov. 1945), Moana (sunk 31 Oct. 1927, Gertie and the tug Plucky and four old dredges. They were sunk alongside the mole, harbour side. 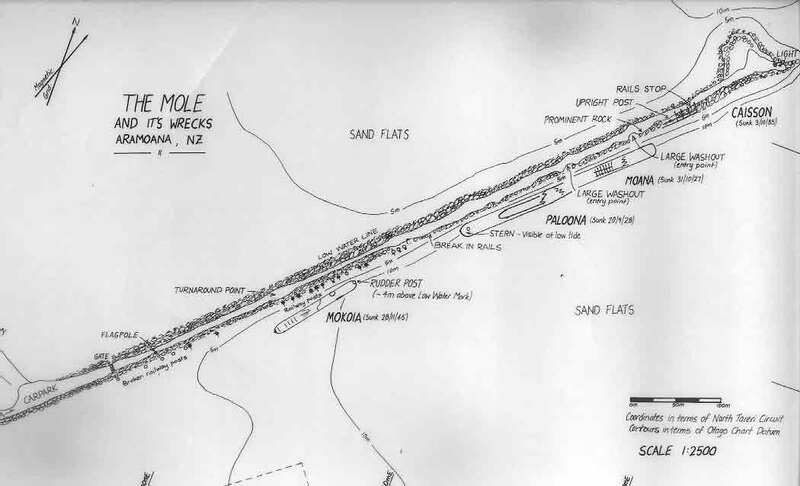 The main channel of the Otago Harbour is kept clear of sand build up by the Aramoana mole, originally called Cargill's Pier, an artificial breakwater which extends for 1200 metres from Aramoana, was a late 1920s project. A row of bleached, skeletal timber frames beside the mole is a relic of the railway line that carried wagons of rocks for the mole. Some workers later built cribs and kept coming back for fishing and relaxation. The Otago Peninsula is on the south side of the Heads. The Union Steam Ship Company was sold to P. and O. line in Nov. 1917. Ref: Port Chalmers and Its People by Ian Church. The name Aramoana is Maori for "pathway to the sea". Caisson sunk 3 Oct. 1985. Streets in Auckland named after the early ships or master mariners and seaman. "No sea can hurt her..."
Cook referring to the H.M.S. Endeavour. If you know any history on any other place names and the origins of their names, please let me know and I'll add them. Thanks.